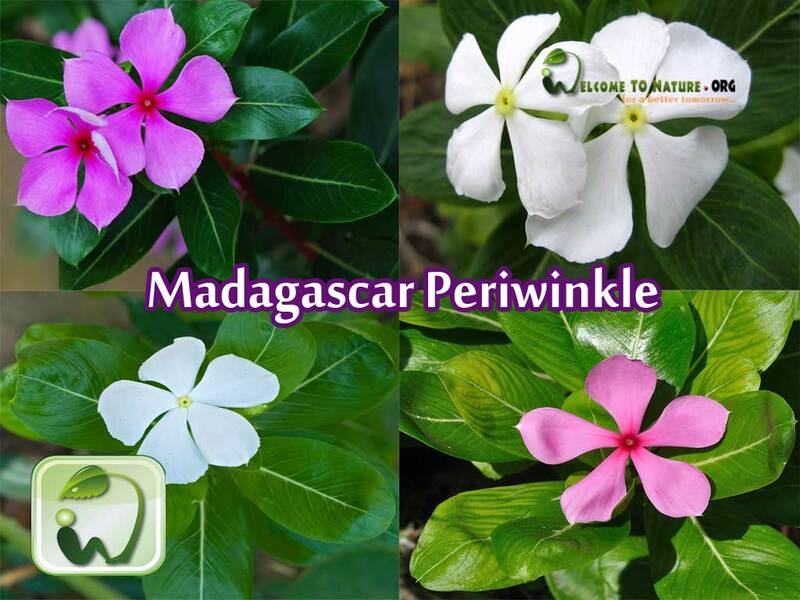 Madagascar periwinkle is a herb or an evergreen subshrub that grows up to one meter. The leaf is glossy green. This plant always blooms. The flowers are mostly seen in white, purple or violet in colour. It is also seen in red colour. Other names are Ammocallis rosea, Cape Periwinkle, Catharanthe, Catharanthus, Church-Flower, Old Maid, Periwinkle, Red Periwinkle. The plant having white flowers are known as Vinca Alba and plant with violet flowers are known as Vinca Rosea. The plant contains, mainly the bark of the root contains alkaloids like ajmalicine, serpentine, reserpine. Also the leaf contains vindoline, lurosine, vincaleukoblastine alkaloids. It’s good to reduce blood pressure. Reduces the sugar level in blood. Since many years it is used as a medicine to cure diabetes. It is soporific. That means it induces sleep. Helps in treating all types of cancers including Hodgkin’s disease, cancerous lumps and leukemia. The alkaloids in the plant help to do this. It can be used as an antidote. Take 21 leaves of Madagascar Periwinkle, grind it and have it in morning and evening. It will reduce the sugar level in blood. It is also beneficial to reduce cholesterol level in blood. If a scorpion bytes, put the grinded leaf of Madagascar Periwinkle on the wound. It will heal poison. please give Vaidyan”s contacting no.